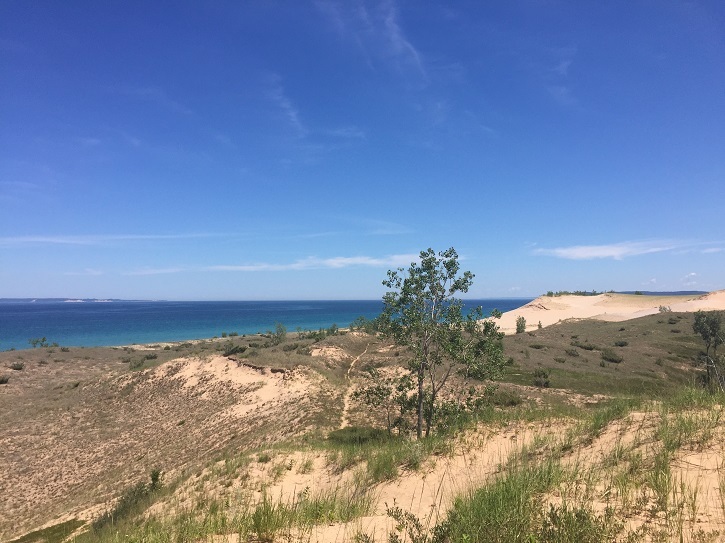 Glen Arbor is a beautiful place to live for active adventurers, nature lovers, artists … Sleeping Bear Dunes National Lakeshore explorations are just steps away whether on beautiful Lake Michigan beaches or awe-inspiring, wooded or dunes trails! Bike the expanding Sleeping Bear Heritage Trail both north and south from Glen Arbor. Boat, ski, paddle, fish and play in Big and Little Glen Lakes as well as several small inland lakes nearby. Explore Alligator Hill for scenic wooded trails and views of Big Glen Lake. Enjoy a leisurely kayak along Crystal River. M-22 is considered one of the most scenic drives in the US. Downtown Glen Arbor offers several boutique shops offering local artists’ designs in jewelry and clothing. Outdoors outfitters will help you with gear for your adventures. Glen Arbor restaurants range from gourmet at Blu to casual fair at Boondocks and Art’s Tavern. The Homestead Resort offers resort cuisine, a ski hill, and condominium and resort homes. Waterfront homes and cottages may be found on Lake Michigan, Big and Little Glenn Lakes as well as small inland lakes nearby. Countryside homes near Glen Arbor offer privacy and acreage. Near downtown Glen Arbor, neighborhoods provide an easy walk to downtown and beaches.